When the Thought Really Counts, Think of Us. In Bloom Flowers is a Teleflora Top 50 Florist. Providing the highest standards of quality and service has been our hallmark since 1989. We have the professional expertise, operational capacity, and quality assurance standards necessary to meet all your floral and gift-giving needs. In Bloom Flowers is locally owned and operated and has been a part of the Dallas/Ft. Worth community since 1989. Each of our 6 locations is staffed with talented floral designers and knowledgeable sales associates. When you have the opportunity, we would love for you to visit one of our shops. Until then, we thought we’d bring our shops to you. Click on Inside In Bloom to step inside our stores. We will call you if we are not able to fill your order. Our shops will always be closed on the following holidays: Thanksgiving Day, Christmas Day, New Years Day, Easter, and Independence Day. 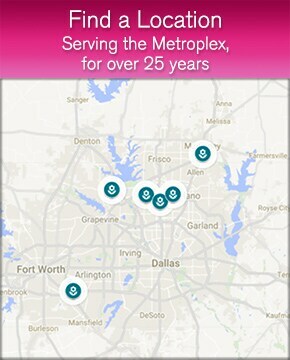 Our shops serve the following areas: Dallas, Ft. Worth, Plano, Carrollton, Arlington, McKinney, Kennedale, Mansfield, Hurst, Burleson, Grand Prairie, Irving, Frisco, Allen, Lewisville, Flower Mound, The Colony, Coppell, Richardson, Farmers Branch, Corinth and Lake Dallas. If you have any questions or need more information, please contact us by e-mail at cust_svc@inbloomflowers.com or call us directly at (800)256-6637. We're always here to serve you and make your flower-sending experience a pleasure. A local delivery fee of $12.95 will be added to each order, for each address. (For deliveries outside our local delivery area, a relay fee of $7.95 may apply.) U.S. orders must be received before 3 p.m., Monday - Saturday, in the recipient's time zone to assure same-day delivery. Orders received after that time will be delivered the following day. We will do our best to accommodate deliveries at specific times of day, but we cannot guarantee it. Delivery of orders to rural route addresses or cemeteries cannot be guaranteed. To place international orders, please call us directly at 800-256-6637. Seasonal and regional conditions affect the supply of flowers. Specific varieties or colors may not always be available. We will do our best to create each arrangement as shown, however, the substitution of flowers and/or containers may be necessary.